WHETHER it is her cow suit, her bikini-clad bottom emblazoned with the Australian flag or the sheep she had in tow down the Ipswich Mall, independent candidate for Ipswich Patricia Petersen wants the good voters of the city to have a laugh at her. Probably not too hard to do you may well say, but Ms Petersen sure knows how to get a reaction. 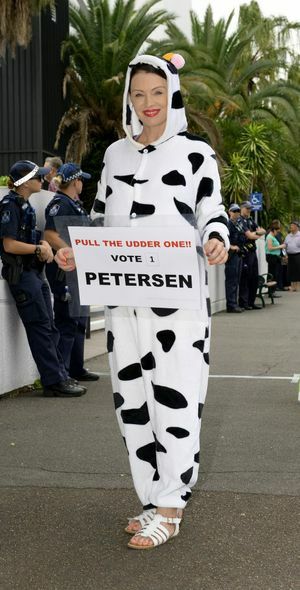 She dressed as a cow at the Labor Party campaign launch, holding a sign saying "pull the udder one" to make the point that she believes Labor has not recognised the State's $80 billion debt as it should. She also opposes the LNP's desire to sell assets to fund debt and labels both parties as "dodgy financial controllers". Ms Petersen took Minnie the sheep down the mall last week to highlight that the public should think for themselves and not behave like gormless sheep when casting their votes. Hard to argue with that. A well-informed and thinking electorate is what we all want, no doubt. Her most recent piece of vaudeville entails posing for a rear view photo in a bikini with the Australian flag prominently positioned. The QT photographers did not take this one, by the way. It was a photo released from Ms Petersen's private and confidential files by the lady herself. The point here is that Ms Petersen will relax on Australia Day and has given her campaign workers the day off to enjoy with their friends and families. She insists all other candidates should do the same. Only "a bum" would do otherwise, she insists. "So don't be a bum," she says. Ms Petersen explains that there is a method to her madness, and a tongue firmly planted in cheek. "The people I speak to out in the community think politicians are a joke," she says. "I think it has reached the stage where politicians need to be able to laugh at themselves, so that is kind of what I am doing. "I understand that people are seeing it as a joke, but I am seeing myself as a bit of a joke along with everyone else. "If everyone else is laughing at me I am going to laugh along with them and have a bit of a fun in the campaign. "Sometimes you can use satire and humour to raise serious issues. 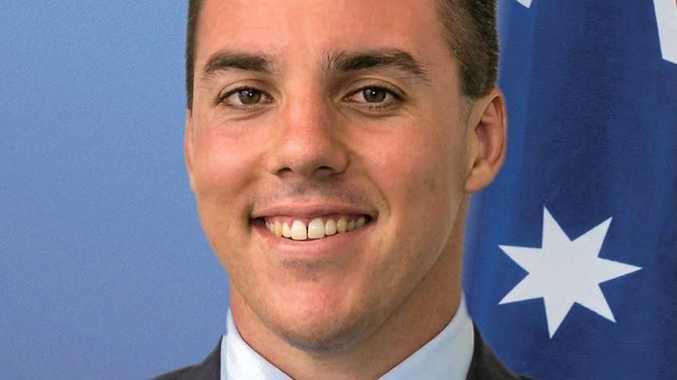 "I am not suggesting that not manning the booths on Australia Day is a serious issue, but the German and Allied forces came to an agreement at Christmas in 1914 and arranged for a ceasefire." Ms Petersen hopes all candidates across the state will do likewise on Australia Day and allow their campaign staff to 'bum around' at home. "I know it is funny sticking my bum out," she says. "It is in jest. But there is something in that as well." Patricia Petersen, Independent candidate for Ipswich, said that she was insisting her campaign volunteers take the day off on Australia Day. Only a bum would put workers on a pre-polling booth on Australia Day.